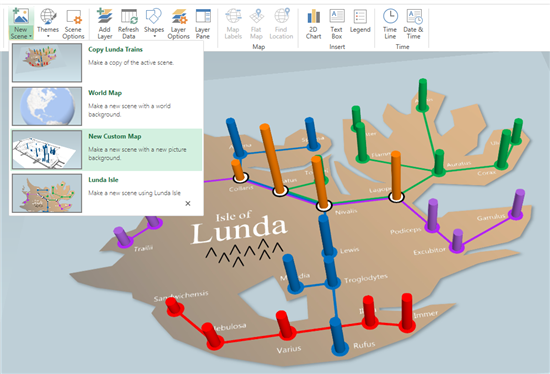 In early September, we introduced you to Custom Maps, a new feature in Power Map for Excel. 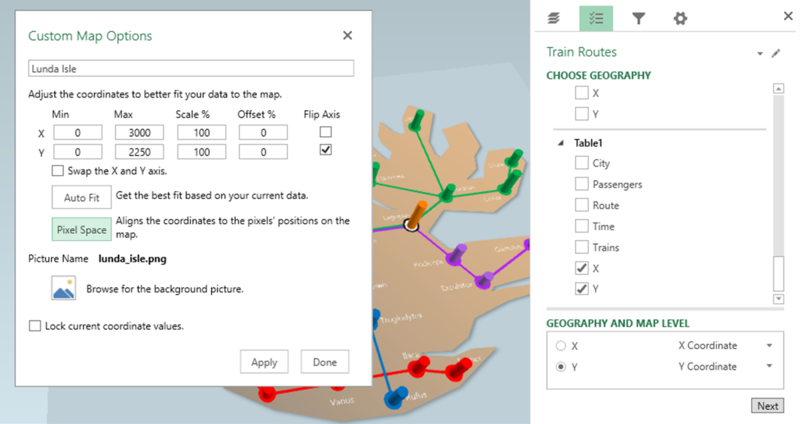 Power Map is part of several analytics and visualization features, such as Power View, that comes with Excel when you get an Office 365 subscription with Office Professional Plus. You can get enhanced versions of these features as part of Power BI for Office 365, our cloud-based solution for analyzing, visualizing and sharing data insights across your company or organization. In this post I’ll show you the basic steps for how to create a custom map with Excel Power Map. All you need is (1) an image with your custom map and (2) data that you can map in an XY coordinate system/plane. That’s it! Let’s get started. 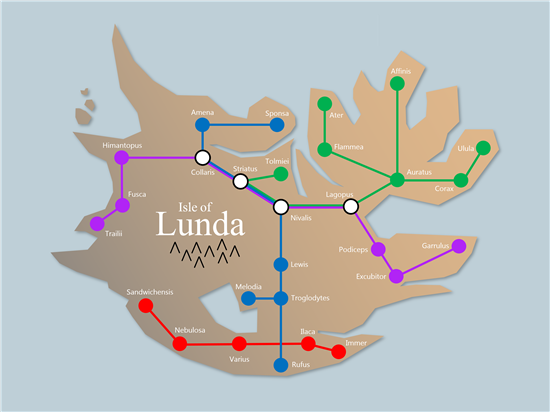 To illustrate the process from start to finish, we’ll walk through the creation of a Custom Map that visualizes train routes on the imaginary island of Lunda. 2. Next, it’s assumed you have some data which relates to the image. For this example, we have the number of passengers on the train routes at given intervals throughout the day. 3. Power Map needs a way to plot your data on an X, Y coordinate system. One such mapping is the pixel placement of where you want your data to appear. In our case, we want to show the total number of passengers on the cities, so we need the pixel position of each city. This is simple enough to do by opening Microsoft Paint, hovering over a city with the mouse, and recording its pixel position in the bottom-left hand corner of Paint into X and Y columns in Microsoft Excel. Repeat for each city. 4. 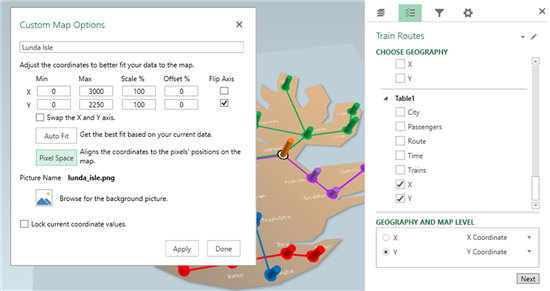 Now that the data mapping is complete, boot Power Map and select New Scene > New Custom Map. 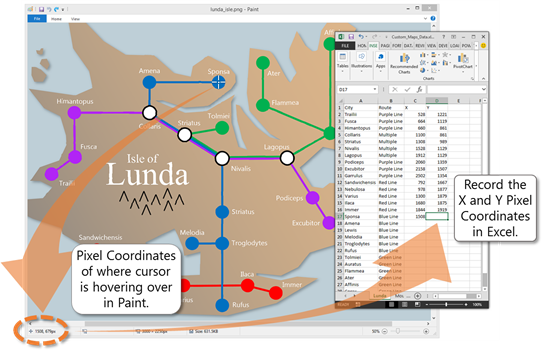 Select the “Geography” of the Custom Map, which will be the X and Y Coordinate System in the Layer Pane on the right. In the Custom Map Options dialog, click the “Pixel Space” button as we’ve already created a one-to-one mapping of the data to the image. If you’re not mapping your data by pixels, there are options to scale and offset your X and Y data in this dialog. 5. Click Apply in the dialog and “Next” in the Layer Pane. Now, you can use Power Map just as you would with any geographical data. Add value and category fields, select colors, and play your tour when you’re finished!